LOVELY NEXT PINK WORK BLOUSE/ SHIRT SZ 10 IN VGC! STRIPED. Condition is Used. Dispatched with Royal Mail 2nd Class. THIS SHIRT IS ACTUALLY BRIGHTER AND PINKER THAN MY CAMERA COULD CAPTURE! IT IS MOST ACCURATE IN THE LAST PICTURE. PIT TO PIT 19" BARGAIN! FAST FREE DELIVERY ANY QUESTIONS PLEASE MESSAGE ME, THANKYOU. THIS IS A 2 COLOUR PINK STRIPED STRETCH POLYCOTTON SEMI FITTED BLOUSE FROM M&S COLLECTION IN A SIZE 18. IT HAS A BUTTON FRONT, COLLARED V NECK AND 3/4 LENGTH SLEEVES. THE COLOUR MAY NOT BE EXACT AS PHOTOS ARE AFFECTED BY DIFFERING LIGHT CONDITIONS. Lovely Autograph Cotton Shirt from the Petite range. Comes with spare buttons for both the front and the cuffs. This is in immaculate condition with no signs of wear. I don't think they are in existence any longer. Floral design and red/white stripes - fun quirky design. bust 49 cm. length 67 cm. Turn up sleeve detailing. Size M = equivalent to UK 12. Length 25". Button on back of neckline. Womens Next size 14 sleeveless blouse, blue and white stripes, workwear smart . Good used condition. Dispatched with Royal Mail 2nd Class. Pink and white pin stripe long sleeve cotton blend stretchy fitted shirt from H&M. 44%Cotton, 29%Polyamide, 24%Polyester & 3% Elastane. A lovely candy striped style - great under work clothes. Please check my other items, i will be listing known brands. If you have any questions please ask. Packaging, time and travel spend included in postage price. I always keep PROOFs of postage. NOTE: Colors on the photo might not looks the same as in reality. SORRY NO RETURNS!!! JAEGER Green White Stripe Cotton Shirt Blouse Size 14. In good condition. Red and pink collarless loose fit blouse from H&M, UK14. Approx measurements: Shoulder to shoulder 16.5" Bust 48" Sleeves 23" Shoulder to hem 25.5" Thanks for looking. Smart Charles Tyrwhitt tailored shirt in pretty green lilac and purple stripes. Perfect for work, also looks great in jeans. Length: 64cm / 25in. Width at underarms: 49cm / 19in. TM Lewin Ladies Striped Shirt. Size 12 New. Blue, yellow, white stripes, original price was £57. Hackett Ladies Stripe Double Cuff Business Work Shirt Blouse. Size 38. Hackett Ladies Stripe Double Cuff Business Work Shirt Blouse. Size 38.. Condition is Used. Dispatched with Royal Mail 2nd Class. GREAT SHIRT FROM DOROTHY PERKINS. BLACK SHIRT WITH SILVER PIN STRIPES ADDS A GLAMOROUS LOOK. 100% linen - no lining. Length: 65 cm. Bust: 50 cm. Very good used condition. Undamaged except for a speck mark inside the collar, see photo. Clean. From smoke and pet free home. EU40. UK10/12. Pit to pit 19in plus stretch. Dispatched by Royal Mail. Worldwide postage is by Royal Mail signed and tracked. If the listing postage quote is higher than the actual postage cost to your country I can send a revised invoice before payment or partially refund you by PayPal after payment. 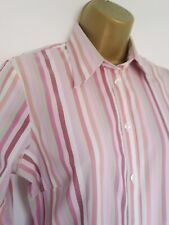 M. Lewin ladies pink pinstripe shirt size 18. Really nice little shirt from M&S Woman in a size 10. It is a little fitted and stretchy. It has a collar, and buttons down the front from quite low down on the chest, it has an open neck under the collar. MARKS & SPENCER LADIES BLOUSE/SHIRT. MULTI PINK/WHITE/BLACK STRIPES. TM Lewin Stripy Shirt Size 6. Condition is like new as hardly worn. An extremely well made shirt by the ever so popular business wear brand TM Lewin. Stripy patterns of different colours. French cuffs which mean you would need to roll up the sleeves or use cufflinks. From a smoke and pet free home. Check out my other UK size 8 items. Happy bidding! T.M. 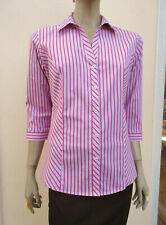 LEWIN LADIES CLASSIC SHIRT/BLOUSE - SIZE 12- FULLY FITTED PINK STRIPES - S/CUFFS - VGC. T.M. LEWIN ladies classic shirt/blouse. pink multi with stripes. very good condition. Black Pin Stripe M&S Work Office Blouse Loose Fit size 16. Dispatched with Royal Mail 1st Class. Excellent condition 10/10 spare button attached. Length 27" Bust 48" Sleeves 19"
Elegant Fransa long sleeve cotton blouse shirt. Lovely striped stiching detail. 22" underarm to underarm. Shoulder to shoulder 17". Selling this beautiful Tm Lewin women’s shirt, size 10. Only worn twice to work, it really looks like new (no yellow underarm marks, pure clean collar). Pink Candy Striped Blouse M&S 12. Condition is New with tags. Dispatched with Royal Mail 2nd Class. This has plenty of give and is flattering but the arms are quite snug for a size 12! JAEGER STRIPED BLOUSE. 19" PIT TO PIT 27" LENGTH. RED WHIT BLUE. GOOD PRE OWNED CONDITION. Due to the lightning and different device (yours and mine) settings, colours may differ slightly.